Want to help this species? Click here. Currently classified as a distinct subspecies of Northern Bobwhite, the Masked Bobwhite (Colinus virginianus ridgwayi) is found only in the Sonoran Desert and semi desert regions of extreme southern Arizona, USA, and northern Sonora, Mexico. Although they were originally described as a separate species, they were reclassified in 1947 as a subspecies based on what were deemed significant vocal and plumage overlaps with the Northern Bobwhite. Females of each type do appear similar; however, male Masked Bobwhite would never be mistaken for their Northern cousins (see photos). Likewise, emerging genetic analysis is beginning to indicate a possible divergence between Masked Bobwhite and other bobwhite populations, perhaps vindicating the full species designation. Regardless of the classification, the Masked Bobwhite is certainly a unique and irreplaceable thread of nature that is in great need of intense conservation efforts to save it from outright extinction. 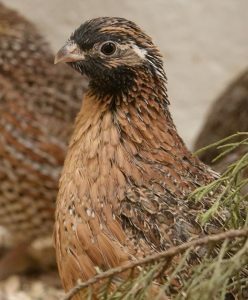 The rangewide decline of Masked Bobwhite has been primarily attributed to intensive livestock grazing in an ecosystem that cannot rejuvenate quickly, particularly during the late 19th century and beginning of the 20th century. So rapid were the declines that wildlife officials actually declared these bobwhite extinct from Arizona more than once over the past century. Yet the bird, known as “Codorniz Mascarita” in Mexico, held on at ranches in central Sonora. From those populations a captive flock was established in Arizona for the purposes of captive-breeding birds for release in the U.S. By 1985, the U. S. Fish and Wildlife Service had acquired a large ranch in the Altar Valley of southern Arizona, which became the Buenos Aires National Wildlife Refuge (BANWR). This 118,000 acre refuge was the only place in the USA where Masked Bobwhite had been known to regularly occur and the refuge was to be managed specifically for the preservation of this critically-endangered quail and its habitat. Despite the best efforts of all agencies involved, the Masked Bobwhite continues to hover on the brink of extinction and, sadly, has not been verifiably reported from its last stronghold in Mexico for the past five years. While the outlook may seem bleak, there is also cause for optimism. In the 1970s, reintroduction efforts on the Buenos Aires Ranch and nearby ranches resulted in a reestablished Masked Bobwhite population. However, there was a change of ownership of the ranch in 1983, and the largely positive range management practices that had been used over the previous 30 or so years were discontinued, and conditions deteriorated. Even after the USFWS purchased the ranch decades of recovery were necessary before it could again support Masked Bobwhite. A sizable captive breeding flock exists at BANWR, and captive breeding efforts with these birds have produced many offspring. However, until the habitat could be largely restored, reintroducing these offspring into the wild failed to support a self-sustaining population and, as a result, large-scale releases were halted in 2005. Since that time the BANWR staff has refocused resources into habitat management and those efforts appear to be making gains at restoring conditions suited to the Masked Bobwhite. By 2017, several portions of BANWR were assessed as being “Quail Ready” by biologists, and the first large-scale release in a dozen years occurred in fall-winter of 2017-2018. So that not all captive Masked Bobwhite exist in one facility, BANWR staff worked with colleagues in Puebla, Mexico to transfer 70 birds to a separate facility at the Africam Safari Zoo in 2015, and an additional 70 birds there in 2016. The Africam flock will serve both as a hedge against a catastrophic event that could wipe out almost the entire global population currently housed at BANWR, as well as provide captive-bred offspring for release in Mexico since moving any species across international boundaries can be very complicated and drawn-out. The Sutton Center’s commitment to the conservation of rare birds, and particularly our experience with gallinaceous birds, led the U. S. Fish and Wildlife Service to approach the Sutton Center about possibly becoming another breeding facility for the critically-endangered Masked Bobwhite. In the spring of 2015 we were in a position to begin serious conversations with the Masked Bobwhite Recovery Team about the potential partnership, which resulted in USFWS funding to renovate our existing yet vacant quail facility to house and breed Masked Bobwhite. 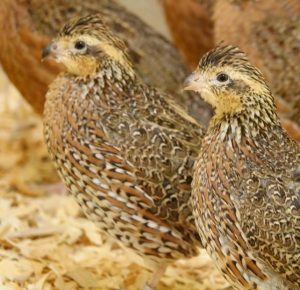 Two shipments of Masked Bobwhite eggs were delivered in September 2017, and we now have a breeding population and will be providing young quail for release on BANWR in summer 2018. Don places temperature & humidity dataloggers under various types of vegetative cover. Masked Bobwhite may need to take refuge under such spots on extremely hot days or cold nights in the desert, and such microhabitats may be critical to any successful reintroduction effort. Senior Biologist Don Wolfe has been selected to join the Masked Bobwhite Recovery Team, which oversees all aspects of the species’ conservation efforts. From June of 2015 through October 2017, Don deployed and monitored temperature data loggers along an elevational gradient and in different vegetation types to develop thermal mapping, and aid in selection of potential release sites. As with any bird species, bobwhites have specific thermal tolerances, as well as particular habitat needs and vegetation preferences. Even at small scales the difference in temperature in areas of respite from the searing heat or freezing cold, called thermal refugia, can be life-saving for bobwhite. The Sutton Center has also taken the lead on setting out informational posters in both English and Spanish in southern Arizona about the rarity of Masked Bobwhite and how sightings can be readily reported. We are in the process of recruiting capable volunteers in southern Arizona and Sonora that can assist in verifying such reports. Across the vast and remote area where Masked Bobwhite once existed, this volunteer verification team will be of tremendous value in confirming hopeful reports that this bird may still exist in the wild. Masked Bobwhites (females left, male right) in the Sutton Center’s captive breeding program. 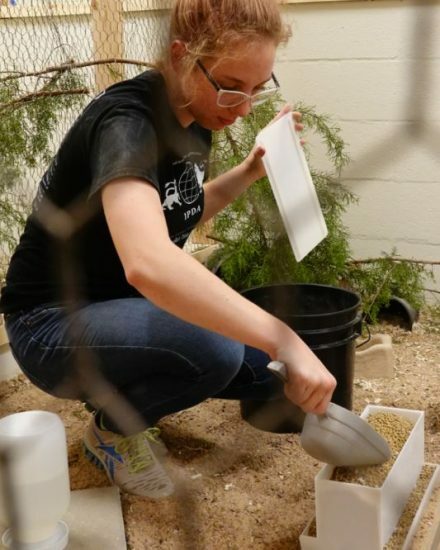 A Sutton Center summer intern refills the feeder in one of the captive breeding chambers that houses a pair of Masked Bobwhites. Until the Sutton Center became involved, nearly all of the world’s population of Masked Bobwhite existed at a single facility in the Arizona desert. 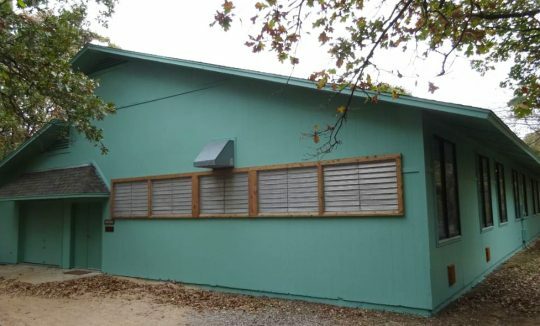 After remodeling of our quail building was completed (above), the Sutton Center established a second captive breeding population to help wild populations become re-established in the USA and Mexico. If you may be interested in assisting with our breeding and reintroduction efforts, either through funding, logistical support, or in-kind donations/volunteering, please contact Don Wolfe to work out how you may contribute. You can also earmark for the Masked Bobwhite project your donation to the Sutton Center by adding a “for Masked Bobwhite” comment in the donation form.